Today is day 4 of the Positivity experiment and I am pleasantly surprised at how quickly it has spread! I have been getting so many mails and messages from friends about how interesting they find this experiment and how they are using it to turn around their lives! It was just started on a whim but now we have so many people joining in and telling us how happy it is making them. The response was so overwhelming that Preeti has started this facebook Group so that the positivity can continue to flow even after 7 days ! Do join in and spread the positivity around by sharing with us the five things that made you happy ! (To those of you who are reading my blog for the first time, the 7 days of Positivity initiative was conceived by Preeti Shenoy over at Just a Mother of Two. It’s a wonderful concept where we blog about 5 things that we are grateful and thankful for every day. The idea is to focus on the happy and positive things in our lives and not on the negative. So here are my 5 Mood uplifters for the day! 1) A very good friend whom I had been badgering to read my blog for a long time finally started reading it regularly because she was intrigued by the Mood Up-Lifters posts that I have been doing! She also wrote me a lovely message telling me how much she enjoyed my writing and that quite made my day ! 2)I love listening to Yanni and had bought a lot his cds many years back. I had forgotten about them but came across them today while looking for something entirely different. I spent an happy hour or so listening to them and rediscovering the magic of Yanni ! 3) During lunch at home we ended up discussing how delicious my grandma’s mango chutney was and how much we miss it (she is no longer with us). This made me take a trip down memory lane and remember the summer holidays at my grandparents. My happiest memories are of the time spent with them so remembering those days really made me happy ! 4) We made bhelpuri at home today. crunchy, tangy and very spicy. Just the way I like it ! 5) I needed to read and sort out a few important papers. A boring task that I had been putting off for a very long time. Finally tackled it today. I’m glad I finished it !. My list for today is made of very simple and mundane things. 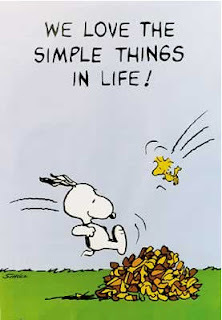 But that’s the idea isn’t it – to enjoy and be happy about even the simplest things in life ! Desire the good of all and the universe will work with you. But if you want your own pleasure, you must earn it the hard way. Mango chutney.. so yummy.. :) Its been a long time since i had it.. Brought back a lot of memories back.. thanks for this small positive.. ll mention it in todays post..
@uptake - thats so true ! @Dhanya - Thanks and welcome to my blog ! @Shantharam - mango chutney is a sort of culinery heaven !